Wow, it has been a really, really long time since I've eaten sushi. I've seriously missed it! Back when we were even more spoiled, we had sushi daily at work for lunch. That was a long time ago. I also used to go out to sushi for dinner very regularly, but I honestly don't know the last time I went. Anyway, a few weeks ago, I had to order nightly dinner for a group of co-workers, and used Seamless for the first time. While browsing through the options available, I saw a bunch of sushi places. Sushi seemed like a good idea for take out, since it wouldn't suffer from getting cold. But at the same time, I'm a snob and assumed that there was no remotely good sushi actually available on Seamless. So I cross-referenced all the options on Yelp, and found one that actually had 4 stars: Sushi Taka. I was excited to try it out, but unfortunately, it is available only for lunch, so I didn't try it out for my team dinners, and I eat lunch at work most days. However, on Fridays, lunch at work is always insanity (not in a good way), so I've been looking for an excuse to avoid it, and go out instead. (I know I shouldn't complain, but our office population literally doubles at lunch on Fridays, and our cafe just can't handle it. They try valiantly, but the food is usually subpar, and the lines, full of everyone's 10 best friends and strollers, move at a snail's pace). So, I decided to (gasp! ), leave the office for lunch, and sushi seemed like just the answer. Sushi Taka is not a standard sushi restaurant. It is located in the financial district, and as I mentioned, is only open for lunch, only on weekdays. It thus caters to the business lunch crowd, takeout only. The concept is all rolls, neither nigiri nor sashimi are available. The rolls are cut only once in half, rather than into many pieces. This works for the grab and go style, as you just unwrap each half and eat it, rather than requiring chopsticks. When I first read about Sushi Taka, I expected it to be more like Sushirrito, the other big takeout sushi roll place in the area. But while the idea is similar, they are executed very differently. Sushirrito really is far more sushi-as-a-burrito-style, with huge, very large diameter rolls, whereas Sushi Taka is standard diameter, just longer than usual. Both give you a full meal in a single roll. The menus are also quite different. Sushirrito also has a limited menu, offering only 4 seafood rolls, a chicken roll, a pork roll, a veggie roll, and a salad. All have lots of components, including creamy flavorful sauces. Sushi Taka has 15-20 pre-configured seafood rolls, and of course teriyaki or buffalo chicken versions to satisfy your crazy co-workers who dislike seafood. And just like Sushirrito, some of the rolls have crazy sauces, ranging from sweet like the aforementioned teriyaki to spicy, with some mayo based sauces in the mix. So, if you really want a buffalo chicken "sushi roll", or something dripping with mayo, you can get it, but for the most part, Sushi Taka is more traditional, whereas Sushirrito is more Americanized. But Sushi Taka's main concept is customizing your own roll. In this way, it reminds me of U-Sushi. In fact, their options are fairly similar, but of course U-Sushi serves them as standard cut rolls, albeit cut by a "robot". Anyway, first, you pick a main protein (or go half and half if you can't pick just one). The choices are fairly plentiful, including cooked options like buffalo chicken, teriyaki chicken, teriyaki salmon, and shrimp tempura, and more standard salmon, tuna, spicy salmon, spicy tuna, unagi, and tofu. Not tons of variety, but enough. Then you pick 2 premium sides (or more for an additional fee). The side items were the most interesting components. Some were fairly standard like roe or kanikama. But you could also add tomago or seaweed salad, both things I am used to seeing in sushi restaurants, just not inside my roll. They also offer takuan, kimchi, pickled jalapeño, and guacamole. Yes, guacamole. Since I'm allergic, I couldn't add that, but I almost wanted to just to see what they meant. Avocado is common, but guac ... not so much. Wasn't I just saying that they were more traditional sushi? Whoops. Continuing along the not so traditional lines, you can then pick as many sauces as you want. They have mild miso, teriyaki, and unagi sauces, or soy mayo. Or go spicy, and pick from wasabi, buffalo, sriracha, and spicy miso sauces, or chili mayo. And then, for veggies. Standard cucumber, and optional green onion, carrots, spinach. Unfortunately, the DIY rolls, most of the pre-configured rolls, and the sides are not available when you order on Seamless. Only the "Signature Rolls" are, which is a selection of 3 versions of their namesake "Taka Roll" or variations on a California Roll. When I asked about this, the owner explained that the other items were in limited quantities so he couldn't put them on Seamless. This makes sense for some of the sides, but I don't really understand it for the rolls, particularly as the rolls are all available on OrderAhead and GrubHub. Shouldn't Seamless be the same? I know Seamless supports DIY style, as I used it at U-Sushi. And some of the sides are available on OrderAhead and GrubHub too (seaweed salad, edamame, soup). Why not on Seamless? This was pretty disappointing, as I really wanted to create my own! Speaking of Seamless issues, the first time I went to order, they were closed at 12:15pm. I thought they must just be closed that day. Then, I tried again another day at lunchtime. Closed. I was pretty confused, as I was sure I'd seen them online when looking earlier in the day. And their own website said they were open until mid-afternoon. After several failed attempts, I figured out what was wrong. Seamless had them listed as closing at 10:45am. While I appreciated that they were offering sushi so early in the day, that wasn't quite when I wanted it :) So I contacted the owner asking about it, and he quickly replied, even on a Sunday. It turns out it was a mistake, and he had it corrected the very next day. I'm glad I spoke up! I imagine his business will do much better on Seamless now that he is listed during actual lunch hours! Speaking of the owner, Nick, he was amazingly nice and friendly. Prompt to reply to my e-mail, and when I went to pick up my order, he was welcoming and friendly. You can tell that he cares deeply about his business, and really made the pick-up experience pleasurable. A nice break from my crazy work day. 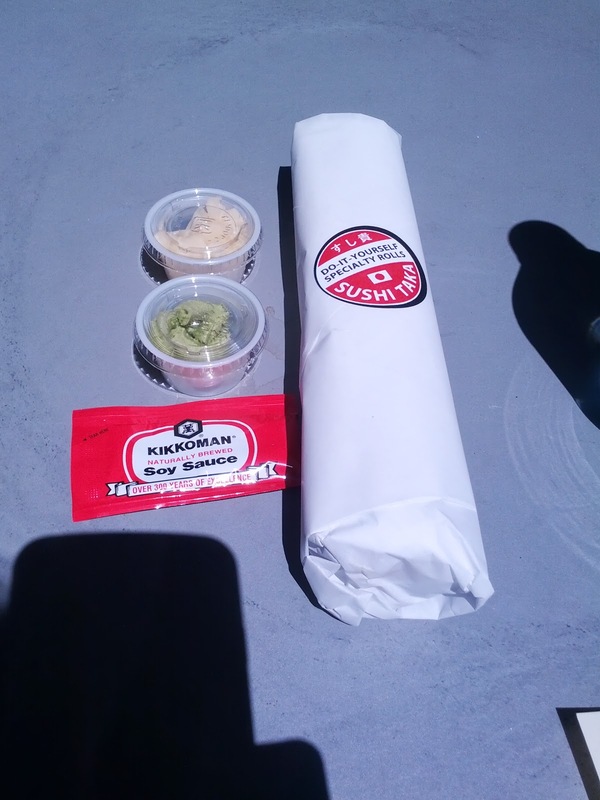 The overall experience was quite smooth, ordering online with Seamless ridiculously easy, and my roll was waiting for me with a friendly smile by the time I got there. 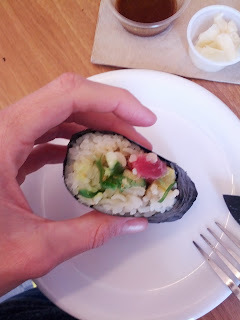 I'll be back, but I really wish I could design my own roll, or get a seaweed salad! Nicely packaged up, with soy sauce, wasabi, ginger. My roll came very well packaged. The outer wrapper held the whole thing together and gave me a surface to lay out when I was ready to eat it. No tablecloth needed! Inside the outer wrapper: Miso Sushi Taka Roll. $8.99. Once I unrolled the outer paper layer, the contents were revealed. The roll was wrapped in several more very tight paper layers, and cut in half. It held together very well. Excellent wrapping job. I ate my first half by just peeling down the wrapper, burrito style. I added soy sauce and wasabi as I went, but found it a bit awkward to eat. Maybe my teeth just aren't sharp enough, but I had a hard time biting through the seaweed wrapper, kinda making a mess. So I brought the other half back to my office and cut it into standard pieces. Inside the Miso Sushi Taka Roll. Since I could only pick from the "Signature Rolls", and I'm allergic to avocado, so I couldn't get a California Roll, my only option was the various "Sushi Taka" Rolls. All featured salmon and tuna, and came in standard, spicy, or miso varieties. I decided to gamble and go for the most interesting sounding, the miso: "Salmon & Tuna (Half & Half), Miso Kanikama, Marinated Seaweed, Takuan, Cucumber, and Miso Sauce". The cucumber and takuan (pickled daikon) added a great crunch to pretty much every bite. I always love takuan, so that was a big selling point for me. I always get seaweed salad when I go to sushi, but I've never had it inside my roll before. It turned out to be a great addition, and I would have welcomed even more of it. The tuna was good quality, and there was a decent amount of it. Again, standard sushi roll amounts, not like Sushirrito where it is insane diameter. I was impressed at this point. But then I pulled out a chunk of salmon to try it own its own, to really evaluate the quality of the fish. It was not good. It was stringy. I could barely bite through it, it was so chewy. It would never be served as nigiri. It was really quite bad, and I removed the rest of it from my roll. This was really disappointing, since every other aspect of the roll was good. Back to the good. Rice is always an important part in judging sushi. The rice was sticky and nicely seasoned. It turns out Nick uses green tea powder in the rice itself, sorta incorporating tea service into the roll. The tea flavor was subtle and I probably wouldn't have identified it, but I think it did enhance the overall flavor. One thing that often goes wrong with rolls with sauces is that they are crazy over sauced. But this wasn't. Miso sauces can often be way too sweet. But, again, this wasn't. The sauce really just added some additional flavor and enhanced the entire roll. So, besides the chewy salmon, everything in this roll was a success. But, the astute reader will realize I said it would have kanikama, aka, crab stick. No, I didn't forget to review it. I think the person who made my roll forgot to include it :( It isn't visible in any of the photos I took, and when I cut the second half up into pieces (and when I removed the salmon), I looked for it, and it certainly wasn't there. Boo. I actually like kanikama! Anyway, this was overall satisfying, and the $8.99 price tag is good for a lunch in the FiDi. 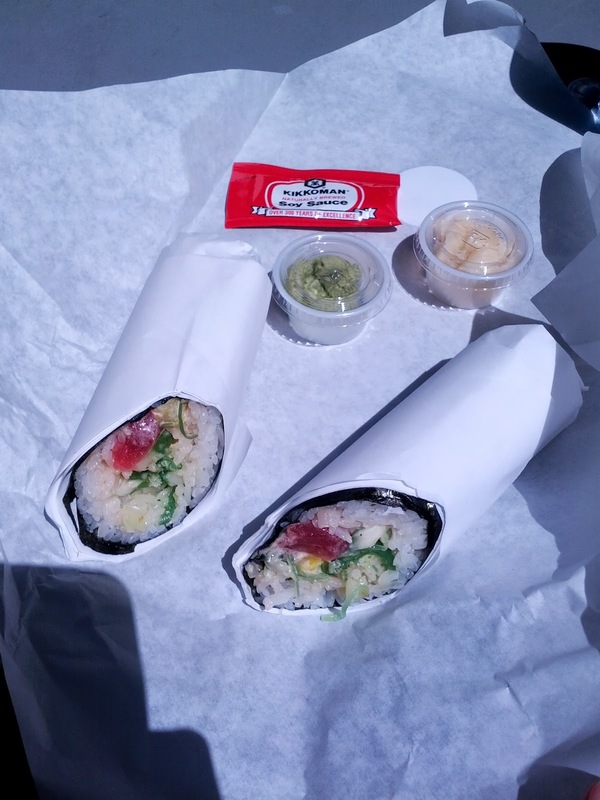 Cheaper than Sushirrito, although it did have much less fish than Sushirrito. For an additional $2.50, I could have gotten the deluxe version, with double the fish. I'll probably go back sometime, particularly if they add the DIY options! Last week, I posted about the frappuccinos from Starbucks. I've also reviewed other things a few other times. But, it seems like time for an update on ... hot beverages! 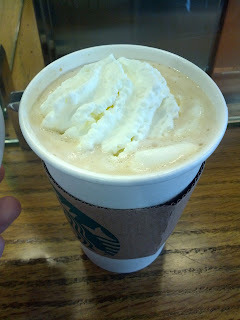 Tall White Chocolate Mocha, Decaf, Soy, Whip. $3.55. 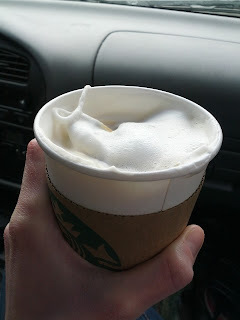 Described as: "Espresso with white chocolate flavored sauce and steamed milk. Topped with sweetened whipped cream." I've never really been a mocha drinker, much less a white chocolate mocha drinker, but I had a really delicious one from Sugar Cafe on a cold, blustery day, and had been craving one ever since. So, I decided to try one at Starbucks. It was very disappointing. It didn't have any flavor at all. I couldn't taste the espresso, and would have believed you if you told me it didn't have any in it. I also didn't taste white chocolate, just some subtle sweetness. Nor did I taste soy. I have no idea how all the flavors cancelled each other out so dramatically, but they did. The whipped cream on top was pretty standard. It also was barely lukewarm. Meh, meh, meh. Would not get again. Tall Tazo Vanilla Rooibos Tea Latte, skim, 1/2 sweet. $2.95. It as a cold, rainy day, and we were driving back from Tahoe. I wanted something warm and comforting. We stopped for gas, and there was a Starbucks next door, so I decided that even though I haven't really liked any of the coffee or espresso beverages at Starbucks, there must be something there that could cheer me up. I scanned the menu, and saw tea lattes. I hadn't ever noticed them before, as I don't generally order tea when I'm out (it just seems crazy to pay several dollars for a tea bag and water! ), and the tea lattes were under the general tea section. I haven't ever even had a tea latte before anywhere, but they seemed like a reasonable idea. I figured it was basically just a really milky tea. I sometimes like tea with a fair amount of milk, and this seemed like a way to add more milk and not cool down my drink. Sounded good to me. I didn't want caffeine, so went for the rooibos. I was a bit surprised when he mentioned that it normally came with 3 pumps of syrup. I was expecting just a tea bag and some steamed milk, not extra sweetness added. I'm glad he mentioned this, as I decided to get it with only 1.5 pumps (his suggestion), and I can't imagine it being sweeter. Seriously, why is everything so ridiculously sweet at Starbucks? I like sweets, ok, I LOVE sweets, but the default version of everything there is just way, way too sweet! When I looked the drink up at home later, I saw the description: "an infusion of rooibos, steamed milk, syrup, vanilla and cinnamon, topped with velvety foam." Aha, yes, syrup. Anyway. I liked this drink far more than I expected to. It reminded me of the milk teas I drank in Japan - sweet, milky, and totally comforting. It really was exactly what I was in the mood for. The tea itself was a decent enough rooibos, and it held up to the milk well. It was sweet, almost too sweet, and the full 3 pumps would have likely been nasty. I'd definitely consider getting one of these again, and I'd be sure to remember to ask for perhaps just a single pump! Tall Iced Decaf Skim Caramel Macchiato. $3.55. 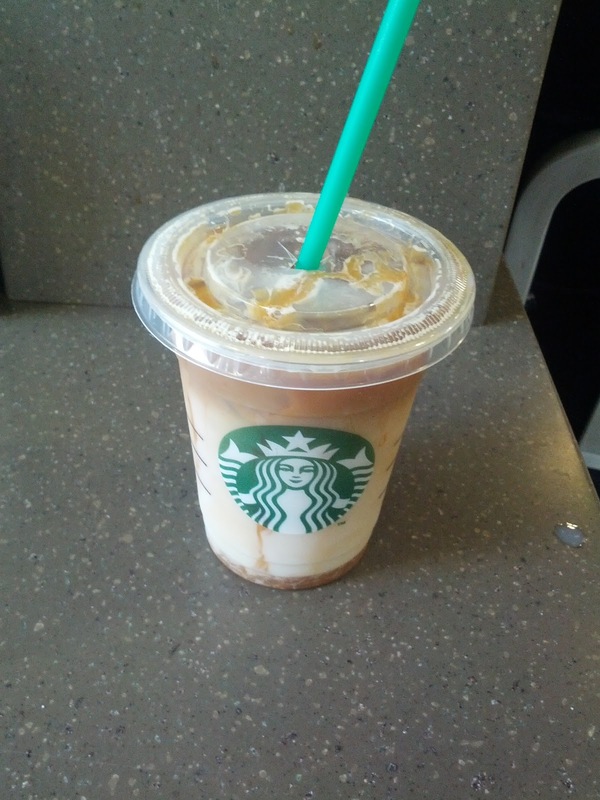 "Espresso combined with vanilla-flavored syrup, milk and caramel sauce over ice." I need to stop taking recommendations. I stopped in on a hot day, and the women taking my order raved about their new hazelnut macchiato (which I did have at a later time, and actually, it was quite good). Why didn't I have it on this visit? Well, she then told me she was out of hazelnut syrup, but that the caramel one was good too. I remembered drinking the hot version of this back before I drank coffee, and thought they were crazy sweet ridiculous drinks. But she said the cold one was perfect on a hot day. Spoiler: it wasn't. This was an incredibly boring drink. Basically, a glass of skim milk, slightly bitter coffee flavored, with some thick caramel stuck to the bottom of the cup. I guess there was vanilla syrup in there too, but I didn't taste it. The only redeeming quality is that it wasn't overly sweet like most Starbucks drinks. The caramel was tasty, but even when I tried to mix it in, I failed. Serious meh.